Rain showers early will evolve into a more steady rain for the afternoon. Thunder possible. High 46F. Winds N at 5 to 10 mph. Chance of rain 80%.. Rain. Thunder possible. Low near 40F. Winds WNW at 5 to 10 mph. Chance of rain 80%. 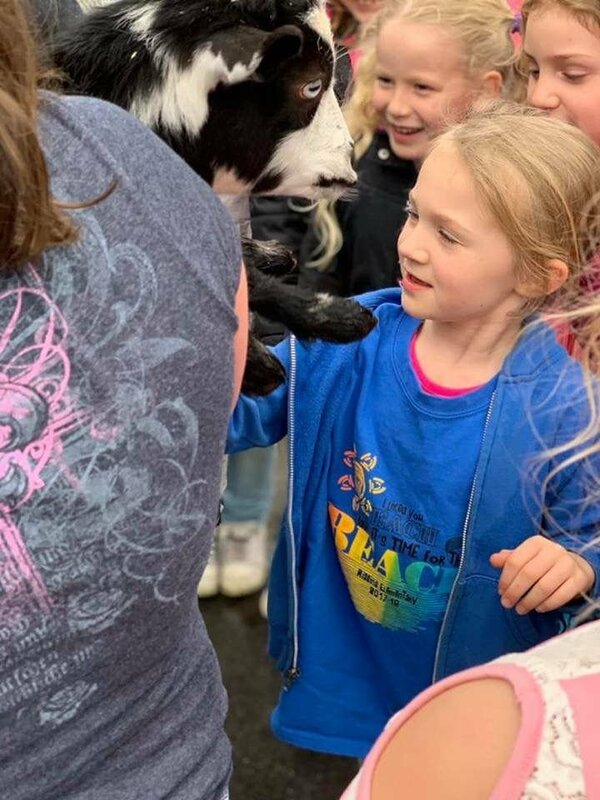 In honor of 4-H Week last week, our Riggins Canyon 4-H Club members hosted a small petting farm at Riggins Elementary School. The kiddos just loved the animals….goats, dogs, chicken, lamb, rabbit, and kittens. And the 4-H’ers were great helping them pet and/or hold them. 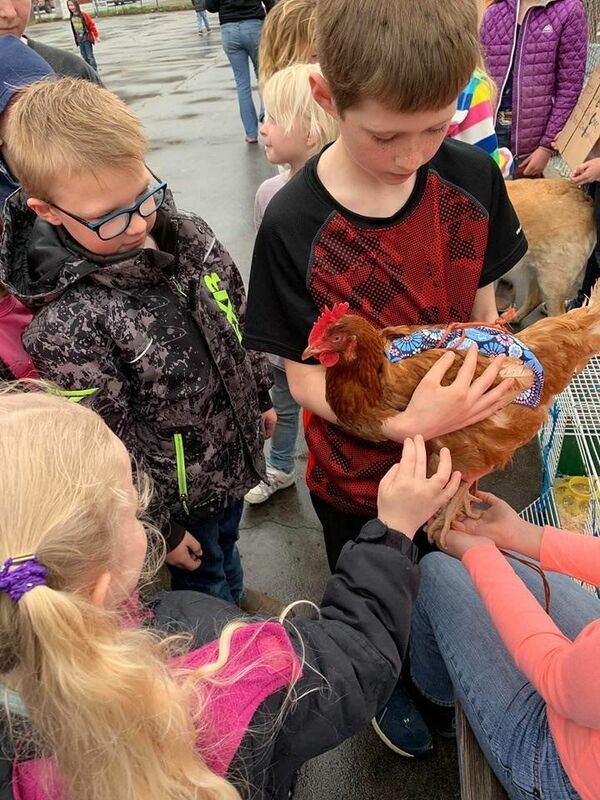 Students enjoy petting a chicken as part of celebrating 4-H Week. RIGGINS -- Quote for this week is mine: “Becoming a grammy or grandpa doesn’t mean you’re old, it means that you’ve been blessed with the most precious gift there is.” …and what a precious week we had with Finn and Darby…as well as a super time last weekend with Kylie and Ty. Ward Hall, former Riggins mayor and active American Legion veteran, will be honored as grand marshal of Riggins 71st Rodeo, “How ‘Bout Them Cowboys!” Rodeo will be held May 4 and 5, with shows starting at 1:30 p.m. MST each day… Queen Brittany Benavides and Princess Elli Klapprich leading the way. Cowboy Breakfast will be held Sunday morning at the Riggins Community Center from 6-10 a.m. followed by the Riggins Rodeo Parade at 11 a.m. Watch for information about Ward Hall, Brittany Benavides, and Elli Klapprich in the Free Press and here in Riggins News. District 3 High School Rodeo first spring rodeo will be held this Saturday, April 13, beginning at noon MST and Sunday, April 14, at 10 a.m., MST, at the Riggins Rodeo Grounds with about 4-5 hours of rodeoing each day. District 3 has more than 50 kids participating; some of our locals are Emily Diaz, Jordyn Pottenger, Levi Cereghino, Clay Marek, and Damon Shaw. Riggins Kindergarten Screening and Preregistration for both kindergarten and preschool for children will be next Friday, April 19, at the Riggins Elementary School from 9-11 a.m. Call 208-630-6055 to make your appointment. Bingo which will be Wednesday, April 17, at the Riggins Community Center beginning at 6 p.m., is getting more exciting with the new game “Queen of Hearts Progressive Raffle.” Regular Bingo will start at 6:30 p.m., for everyone 18 years old and older. Come on out and check out the new game and have a fun evening with neighbors and friends…and help our senior citizens get their transit bus paid off. People will gather, water will ripple, and jetboats will scream by at the Annual Salmon River Jetboat Race next weekend, April 19-21. Racing Teams and past champions from Canada and USA will compete on the Salmon River of No Return Saturday and Sunday. There will be lots of activities in town including the BBQ Friday at 6 p.m., bands, and dancing uptown. For more info call Glenna at 208-315-2309 or glennascott@frontier.net and watch for more details here next week. Riggins Annual Easter Egg Hunt sponsored by the PTO and Riggins elementary teachers will be held at the Riggins Elementary School next Saturday, April 20, beginning at noon with yours truly as the emcee. There will be four divisions: birth-2 years, 3 years-kindergarten, 1st and 2nd graders, and 3rd-5th graders with many, many eggs in each division as well as great special prize eggs. Each participating child will receive 50 cents as well as prizes and money in eggs as well as special prize eggs in each division. Community Easter service 2019 with a joint venture of Riggins churches will be held next Sunday, April 21, at the SRHS football field at 8 a.m., followed by a continental breakfast of muffins, fruit, juice, and coffee. There will be a children’s Easter activity during the service with the help of the Salmon River Community Church Youth Group. Everyone is welcome. 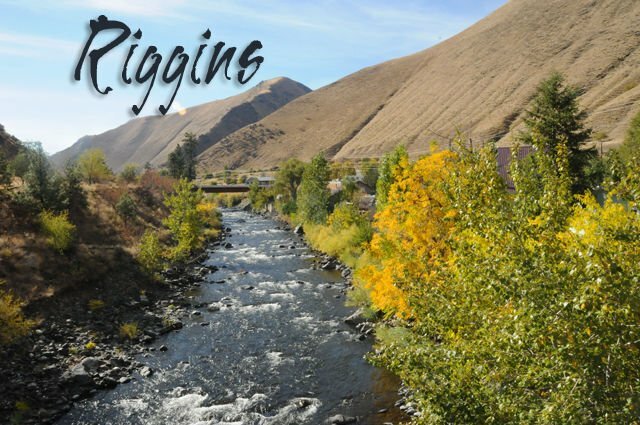 No regular services at Salmon River Community Church nor Riggins Assembly of God Church, so all who want may attend the Jetboat Race. Pinehurst Quilters will host its Quilt Show next Saturday, April 20, at the upper level of the Riggins Community Center from 10 a.m.-5 p.m., with a $3 admission fee. They will have an array of quilts made and displayed by Pinehurst Quilters as well as a featured quilter displaying her quilt pieces. Two quilts will be offered as raffle items; one winner will be announced Saturday, April 20; the other will be announced at the Cancer Walk, May 18. Our Salmon River Middle School art students invite you to their third annual Artists in Time Exhibit Tuesday, April 30, from 2:30-3:30 p.m., in the middle school hallway just adjacent to the SRHS multi-purpose room. Projects will be on display with live status and interactive dialogue with you and the students. See you there. Riggins Rodeo Committee announced that there are two sponsorships available for rodeo events of this 71st Riggins Rodeo. Call 208-628-4084 for details. There will be a baby shower for Payton Branstetter Saturday, May 18, at 2 p.m., at the Salmon Rapids Lodge. Instead of a card with your gift, take a new or gently used child’s book signed by you to help build a wonderful library for the baby. They are registered at Amazon.com. Payton and KJ’s baby girl is expected to arrive July 4, 2019. Save the date for the City Park Stage dedication and fund-raiser at the Second Annual Rattle The Canyon Music Fest in the Riggins City Park Saturday, May 25...three bands: American Bonfire, Muzzie Braun, and JC & the Stingrays will perform throughout the day and into the night. Food and a beer/wine garden will be there…how about you? Leighton Vander Esch News: Leighton has been busy painting a custom European mount which he also autographed for the White Bird Rodeo raffle. He just enjoys doing things for all of us in this Salmon River Canyon where he got his start and remembers how it was and who helped and encouraged him along the way. Thank you, Leighton. Flooding in the area has forced the cancellation of this event.